A final onslaught bookended a great opening stand to power Bangladesh to 503 all out on the second day of the third Test. But Zimbabwe began their reply firmly too, ending up on113 for one at stumps with Sikandar Raza and Hamilton Masakadza on unbeaten fifties. Zimbabwe have more than just a fair distance to cover to remain competitive in the game but that didn't stop Raza and Masakadza, who said before the game that they would go all out for the win, to go after the Bangladesh bowling and pick up easy boundaries. Raza was unbeaten on 54 off 65 balls, having struck nine boundaries. He was severe against anything pitched in his half by Shafiul Islam and Taijul Islam, and used his feet very well against the spin. He drove the ball with confidence though there were moments when he looked slightly like losing control while attacking the spinners. This was Raza's third Test fifty, and it complemented the surprising role he had played with the ball in picking up three wickets. Masakadza also reached his sixth half-century, off 71 balls. He played a relatively subdued role, but still struck seven fours and one six, a big hit over midwicket off Shakib Al Hasan. Rubel picked up the only wicket of the day for Bangladesh, getting Brian Chari to thinly edge one to the keeper in the second over. The decision, initially given not out, had to be reviewed by Mushfiqur Rahim and he was proved right as the third umpire heard or saw something that amounted to an edge. This continued Rubel's great day after he had hammered four sixes towards the end of the Bangladesh innings. Rubel's unbeaten career-best 45, coming off 44 balls with four sixes through midwicket and two fours, took the score past the 500-run mark. He shared a 51-run tenth wicket stand with Jubair Hossain, who was the final wicket to fall, in the 154th over. Bangladesh scored exactly 200 runs on day two but their scoring rate wasn't as impressive as it had been on the first day. 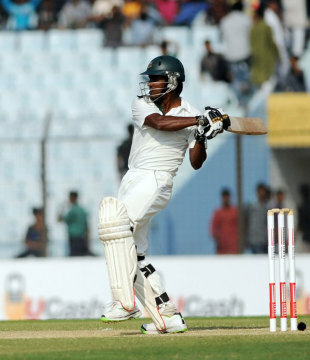 Shakib Al Hasan's 17th Test fifty, 71 off 110 balls, helped them consolidate losses in the middle-order. He struck seven boundaries, a couple of drives through cover and mid-off and two dinks through and over midwicket among them. But he was dismissed to a superb catch by Craig Ervine, who dived full-length to his right in the covers to snap up a top-edge off Sikandar Raza. It was one of the bright spots in the day for the visitors who had to field for two-thirds of the day. The day began well for Zimbabwe when Tinashe Panyangara removed Mominul with a delivery that moved slightly in the air, squaring up Bangladesh's No 4. Mominul made 48 off 100 balls with three fours. Shakib started with the two glorious drives off Panyangara before seeing Mahmudullah and Mushfiqur Rahim fall after short partnerships. Mahmudullah made a lengthy 16, and never looked comfortable. Mushfiqur chopped on a Hamilton Masakadza delivery after making 15. Shakib reached his fifty after the lunch break and was looking primed for the third century of the match when Ervine intervened with his long arms. Zimbabwe took three more wickets and got close to bowling out Bangladesh well before the tea break. But Rubel took a liking to Raza and Panyangara, smashing four sixes and even posing for the cameras with his final hit, which finished on one knee. Raza finished with the best bowling figures, taking three for 123 from 36 overs. Panyangara, Shingirai Masakadza and Hamilton Masakadza took two wickets apiece but Natsai M'shangwe went wicketless through 47 overs.